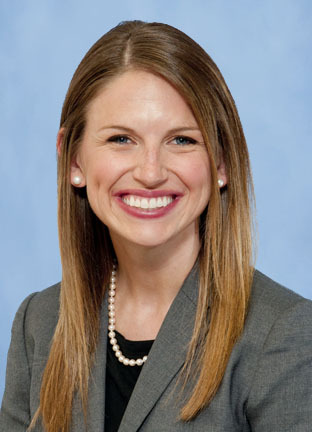 From its birth, surgery residents at the University of Michigan have had unparalleled opportunities to participate in faculty development initiatives. Whether learning in the Leadership Development Program (LDP), sitting as resident representatives on the Departmental Recruitment Committee, or engaging in the Department-wide Implicit Bias Training, we gained an insiders’ view of cultural change in the making. But we weren’t just observing, we were becoming a part of the change. We were learning what it takes to lead from where you are now – whether Chair of the department or a mid-level resident rounding on the wards. We realized that a deep commitment to excellence cannot be achieved without diversity supported by an inclusive culture. Despite the opportunities, there remained gaps for resident inclusion. Programs were tailored to the faculty’s schedule and needs. The demands of surgical training are also changing, so the way we develop residents longitudinally for successful careers must change accordingly. 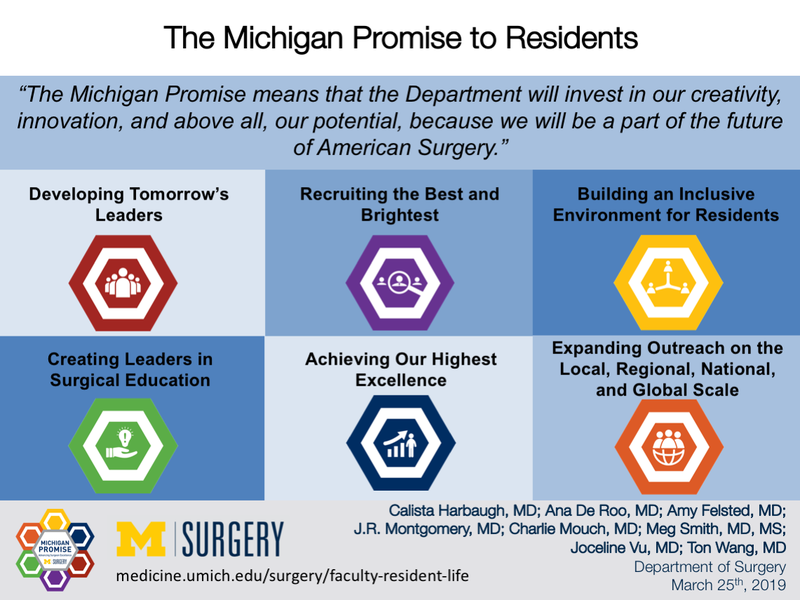 The Michigan Promise means that the Department will invest in our creativity, innovation, and above all, our potential, because we will be a part of the future of American Surgery. We were given a voice in defining our success. 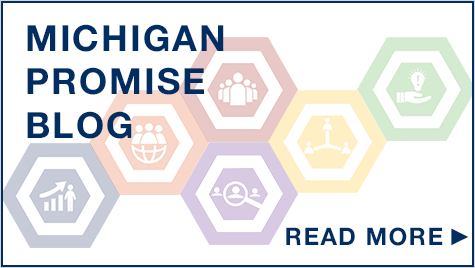 When asked to envision what each of the six initiatives within the Michigan Promise should mean to us, this is what we came up with. 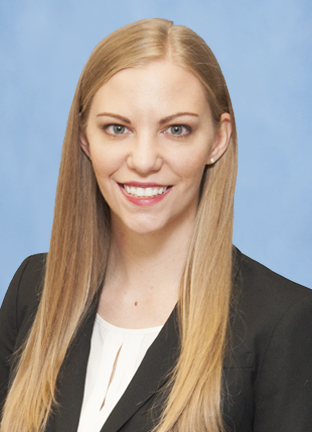 Although leadership is gaining recognition as an integral skill for practicing surgeons, intentional leadership development is not emphasized in residency training. As surgery residents at the University of Michigan, we have exemplary role models of strong leadership across surgical disciplines. Within the Leadership Initiative, we will capitalize on these strengths to help each of us continue to grow into the leaders of tomorrow through three strategies. First, we created a Resident Development Program which consists of a quarterly core seminar series. More than seminars, these are interactive opportunities that invite residents to engage in self-reflection and goal-setting. Sessions have included topics such as Trust and Purpose, Professionalism in the Modern Workplace, the Fundamental State of Leadership, and Difficult Conversations. Second, we aim to establish a Coaching Program for mid- and senior-level residents by trained faculty. Programs such as this offer mutual opportunities for growth and development at both the faculty and resident level. Third, we propose focused leadership development for the cohort that is inarguably the core of the residency culture – the chief class. Traditionally, we advance into leadership positions as a function of time rather than merit. This program will recognize the responsibility of the chief class to develop a shared mental model of the culture they intend to create, creativity to establish that culture, and accountability to sustain it. Academic surgery is increasingly diverse and collaborative, with no single phenotype for success. Residents need to develop a purpose-driven vision of their career trajectory and the ability to identify and prioritize experiences. These cannot be accomplished without strong mentorship. Within this initiative, we are working to develop a staged approach to mentorship that adapts to resident needs throughout various phases of residency. At the junior level, we are working to create a new model for early mentorship. Mentorship is best when organic and often requires a team of mentors to cover the scope of clinical, academic, and personal goals. However, identifying even one mentor takes time that could be spent exploring opportunities and initiating academic productivity. Therefore, we are creating a structured mentorship program for junior residents that includes faculty and senior resident mentorship. This model is intended to provide direction as interns integrate into residency and begin to explore their academic interests. These early mentors can help guide junior residents toward new mentors that align with their interests. As the resident begins to identify their mentorship team, they will transition into a second model of team-based mentorship: Resident Launch Teams. During two years of Academic Development Time (ADT), residents will meet with their launch teams every few months. These meetings will focus on developing each resident’s personalized long-term career goals, to aid in developing a cohesive research portfolio. Resident launch teams have been piloted over the past year to great success. By nature, the field of general surgery is a constantly shifting landscape in which new ideas, devices, and solutions have the potential to completely alter the paradigms of patient care. Surgeons are natural innovators and learn to combine technical skill with creative problem-solving to continually strive for excellence.  The University of Michigan, with nationally ranked programs in medicine, engineering, and business, is uniquely suited for multidisciplinary collaboration to support innovation in our residents. However, in order to remain at the cutting edge of medicine, we need to expand our expertise to the field of innovation and entrepreneurship. This initiative is aimed to develop a model in which innovation is an educational benchmark and all of our residents are adequately trained to fully incorporate innovation into all aspects of their careers. We are developing structured education in the field of innovation and entrepreneurship in partnership with the Biomedical Engineering Program, Medical School, and Office of Technology Transfer. This will be a concise, pragmatic curriculum which will educate residents on innovation and entrepreneurship, with a specific focus on the evaluation of the safety and usefulness of new technologies in the medical environment. Second, we recognize that motivated residents should be supported to pursue their passion in innovation. Therefore, we are developing a dedicated innovation track during ADT. 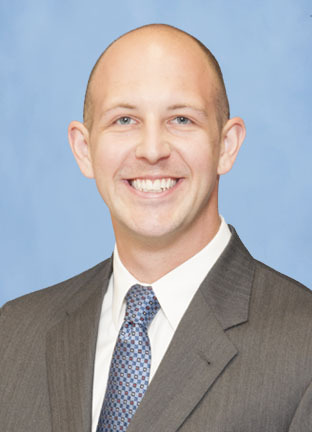 Interested residents will be paired with mentors in surgery and a collaborating department (e.g., engineering, computer science, or business). Working with their mentors, they will have opportunities to cultivate an idea, define the research and design elements, and apply for internal and external funding. During ADT, a resident pursuing this track would work full-time on their innovation proposal and participate in the Surgical Innovation Development Accelerator Course (SIDAC). Our vision is to create a workplace where all members of the Department of Surgery will be empowered to achieve their best in an academic environment that explores, continually improves, and celebrates the core value of diversity manifest through an inclusive environment. To build an inclusive work environment, we feel that residents must feel a sense of social belonging and cohesion within their community, regardless of one’s identity (gender, race, sexual orientation), past experiences, goals, and personality traits. In addition, we must promote engagement within the residency program, because engaged members will take initiative, work harder than is asked of them, and willingly help others in need. Implicit bias training and cultural competence is a necessity, but these should occur with the Department as a whole. There remains a resident sub-culture. To better understand this, we will initiate an annual assessment of climate and culture. This will be critical to informing the primary strategy: an Annual Resident Retreat. The Retreat will unite all residency training programs within the Department. The Retreat will not be focused on the day-to-day mechanics of survival as a surgery resident, but aim our vision higher: to build the community, to recognize value, and establish an environment where everyone can flourish. 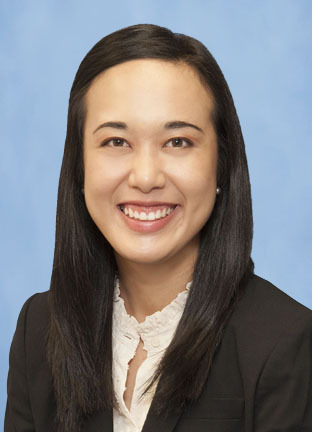 The Department of Surgery aims to recruit applicants and future residents who will become the Leaders and Best in academic surgery, with an intentional focus on cognitive diversity and potential, rather than opportunity. We recognize the vast differences in the recruitment of faculty as compared to the recruitment of residents, but there are no “Best Practices” to draw from other industries when your next job is assigned by the Match process. Therefore, we will rigorously study ourselves at the University of Michigan to identify specific areas for improvement in our current recruitment process in order to expand the diverse pool of the talented applicants we train. We will iteratively develop novel ways to measure the critical characteristics we define as necessary for success in our unique culture. We will continue to internally motivate and demand growth from ourselves, accepting that our purpose is to continue to explore, develop, diversify, and evolve as a system. There has been increasing recognition of a significant lack or absence of adequate surgical care available throughout the developing world. This has led to a strong interest within the surgical community for the development of health care systems and surgical delivery models to address this need. This work requires extensive training, investment of resources, and collaborative models of multidisciplinary providers. 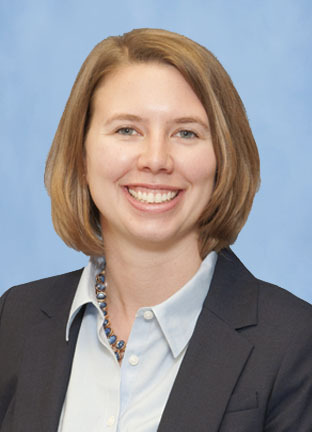 In the University of Michigan Center for Global Surgery, we have leaders who are engaged in partnerships with local clinicians in India, Ethiopia, and Ghana. We hope to equip interested graduates of this training program with the skills to make effective, sustainable, and culturally appropriate changes to the way surgical care is delivered throughout the world. Through this initiative, we are developing a pathway for residents to participate in global opportunities for short-term experiences during ADT, under the premises that the experiences are part of a long-term commitment with local clinicians. 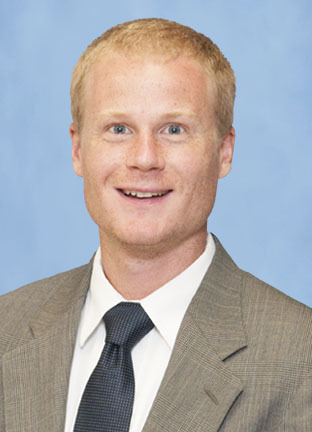 In this way, residents can contribute to the overall mission of the faculty’s work while developing their own skill set in cross-cultural and global surgical care.